Over the last year, I've been doing freelance marketing consulting for a wide variety of clients, ranging from a prominent chef in the NYC hospitality scene to a Miami-based e-commerce site. The services I offer include creative direction, marketing strategy, content creation, and social media growth. Read below for a client spotlight on an NYC-based architectural design firm to get a sense of how I typically work with a client as a consultant. I have been working with Mapos for about two months, since the beginning of December 2016. Here, I'll walk you through the process and beginning stages of marketing strategy. Mapos is a full-service architectural design firm that specializes in hospitality, retail, and residential design. They have a wide range of clients that include large beauty brands such as Fresh & Caudalie, big retailers like Asics & Citizen, and companies like ?WhatIf!. Mapos needed a way to convey their vibrant personality and impressive work across all of their marketing channels, which includes their blog, Facebook, Instagram, and email. Additionally, the SEO value of their site needs a drastic improvement. Creative direction for marketing, creation of brand voice, SEO technical assessment, SEO keyword analysis, content strategy, and social media maintenance. I had recently heard about Mapos' need to bring on a marketing consultant or agency. I scheduled a call with them to chat about what they were looking for. After listening to their perspectives, I put together an assessment of their current state of marketing that included improvements they could make on their website and organic social channels. I like to begin any new client relationship with an in-person kick-off meeting, which is an opportunity to get everyone involved and give them an opportunity to voice their opinions. For this specific meeting, I prepared a list of questions that covered three main categories: Mapos' personality, the current competitive landscape, and Mapos' voice & vision. I also created a quick active exercise for the two founders of Mapos to complete. It was a series of opposite words on a spectrum, and both founders had to mark where they thought Mapos was on each one. It was a way for me to understand their thinking and to see if we were all on the same page. To the left, you'll see a few of my notes from the meeting, and the two completed exercises. View the original kick-off meeting document here. As a consultant, I always put together a project plan and timeline, to streamline communication and ensure that the client knows what is going on at all times. This project plan acts as a central place to refer back to. When the contract was signed, there was an initial 4-phase approach outlined in it. 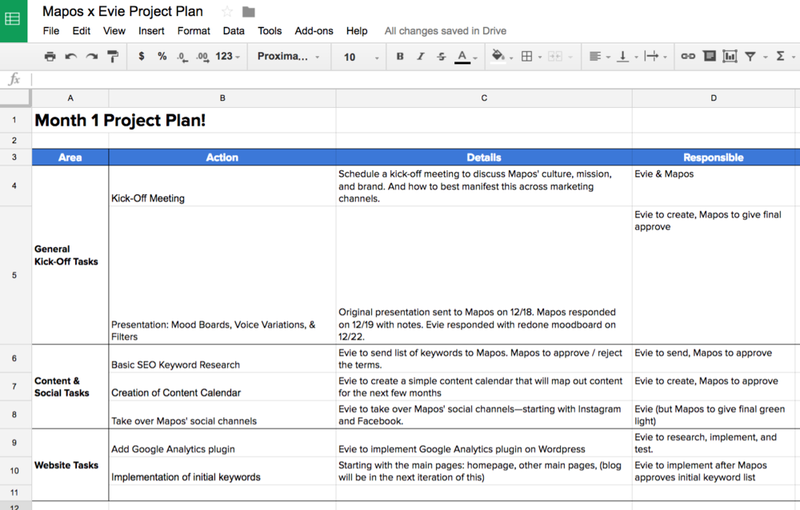 I turned that info into a simple project plan spreadsheet to help us stay on track. Tasks are updated as needed with relevant changes and links. View full project plan here. Images sourced from architecture blogs, Instagram, Pinterest, and others created by me. After our kick-off meeting and creation of the project plan, it was time to dive in and create mood boards to define the overall direction of marketing efforts. I created 3 initial different directions based on some of the concepts that we talked about from the kick-off meeting. Mapos and I worked together through revisions until we achieved a final result that we all liked that accurately conveyed their brand personality and helped them connect with their fans & followers. I also created 3 different "voice variations" for marketing channels and "filters" to use on visuals. 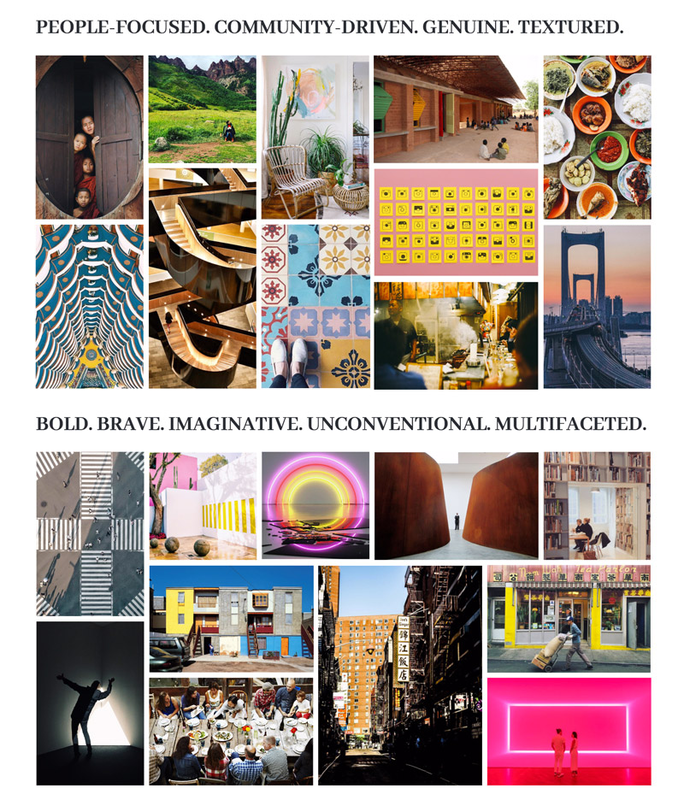 View initial mood boards here. View revised master mood board here. To stay in consistent communication, the majority of correspondence is done through email—with a few check-in meetings and calls.